If you are a historical society, law enforcement group, or other entity that is interested in looking for metallic artifacts for potential display or other use, the Dayton Diggers is here to help! There is no task too big or too small. We will tailor our survey to your organizations’ need. We can proceed in a manner YOU are comfortable with. After our survey process is over, depending on which type of survey was chosen, the information is assembled and given to the organization. We will research and attempt to identify all objects recovered during our surveys. It is important to note that some iron objects might be too far rusted and deteriorated to be successfully identified. If your organization is interested in pursuing a survey or have additional questions, please email us at DaytonDiggers@gmail.com or use our contact page. 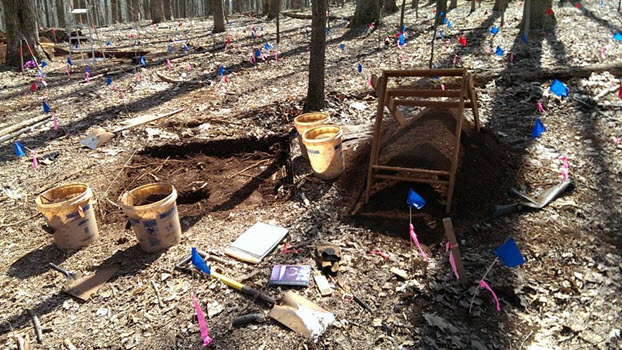 Similar to the Archaeological Record Survey, but no digging actually takes place. The finds are all recorded on a map for the organization. This process is non-invasive and gives the organization a good idea where certain activities might have taken place. 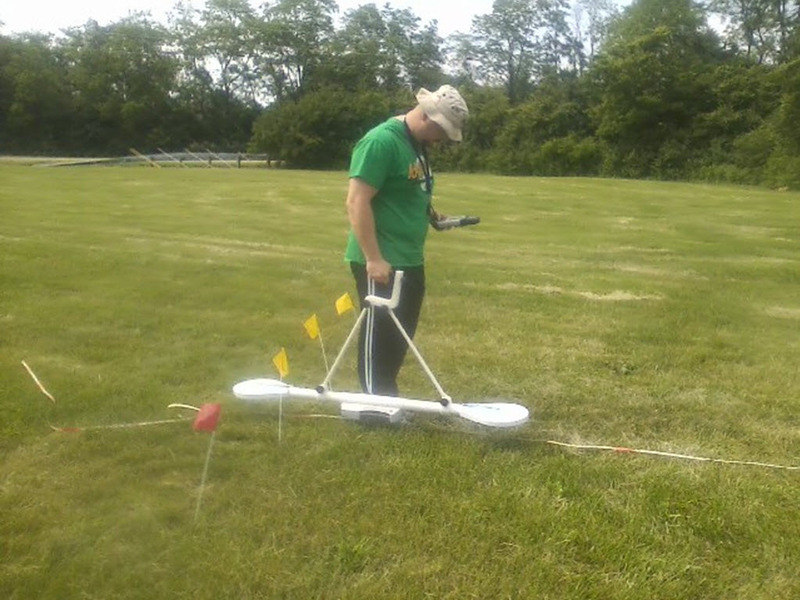 This type of survey has been used in places like cemeteries where digging might be undesirable, but the location of a former church or structure might be located. A particular area is mapped, roped off, and logged with GPS. We then set up a grid pattern of 5 foot squares. Then a process of marking finds via flags is recorded. Then those finds are recovered an documented. This approach is very time consuming, but is an excellent way to fully document items recovered at a historical site. A much faster type survey that recovers and documents all finds, but is not mapped out using a formal grid process. 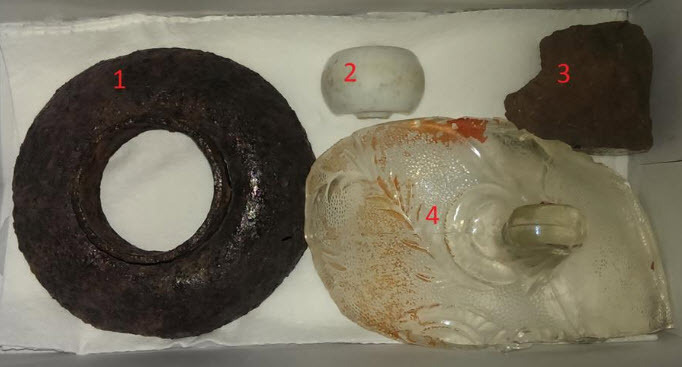 This type of survey is very popular and still allows objects to be recovered, documented, and displayed appropriately. This version is useful for organizations who simply want to create a display for a certain historical location. The Dayton Diggers participated in a recovery survey with the Wayne Township Huber Heights Historical Society (WTHHHS) at the location of the historic Taylorsville Inn. The Inn was active on the Miami & Erie Canal throughout the life of the canal. The structure is now gone, but the landing site is still visible.The Diggers enjoyed working with the WTHHHS folks and helped them recover, document, and preserve history for a display that they can use at their many events. 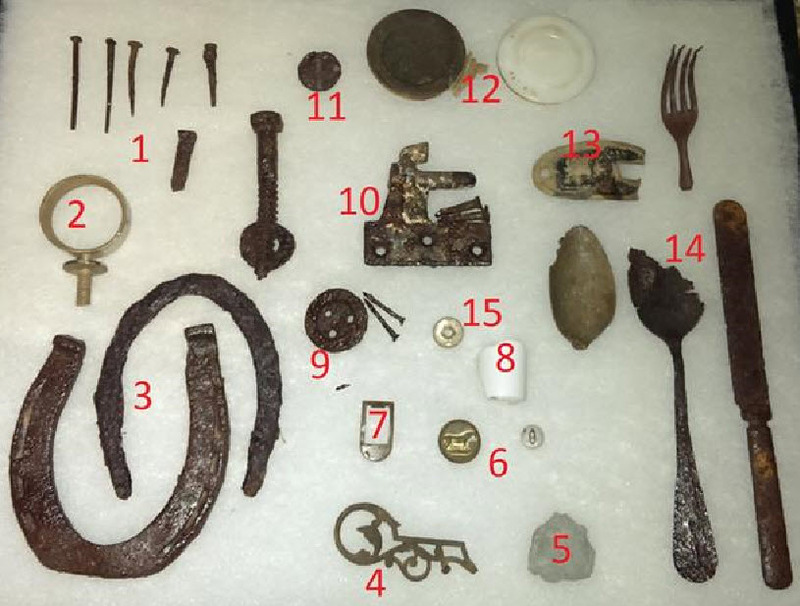 Relics recovered at the site of the Taylorsville Inn for for the Wayne Township Huber Heights Historical Society. 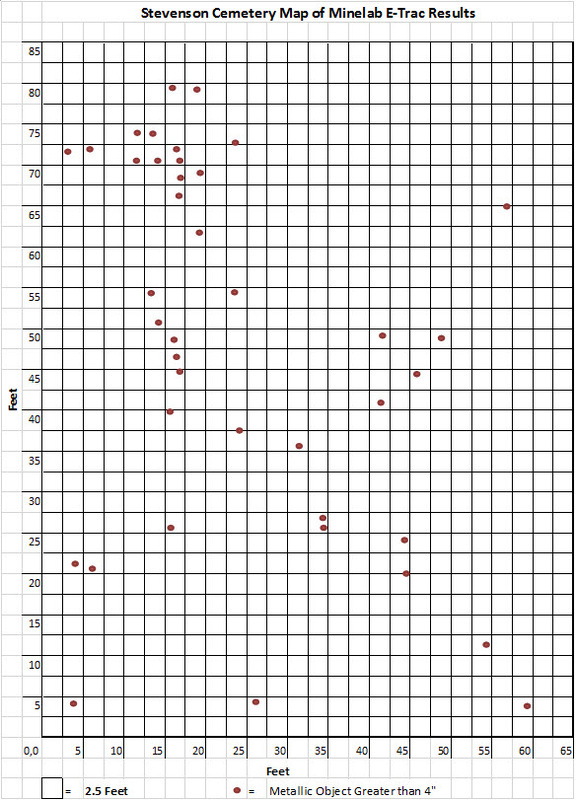 Archaeological Record type survey – Blue flags are mark the grid squares and red flags mark the metal objects. Jared Shank pictured in photo. Archaeological Record type survey - Showing excavation/sifting for metallic and non-metallic items. 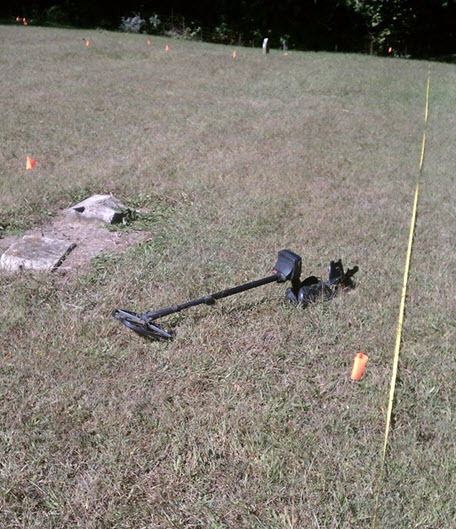 Basic Detecting-Only survey at Stevenson Cemetery showing the lines used and orange flags marking the locations of metal objects. Basic Detecting-Only type survey. This grid is from Stevenson Cemetery in Greene County. It can be overlaid with parts of section C of the cemetery, to show where metal objects are present. 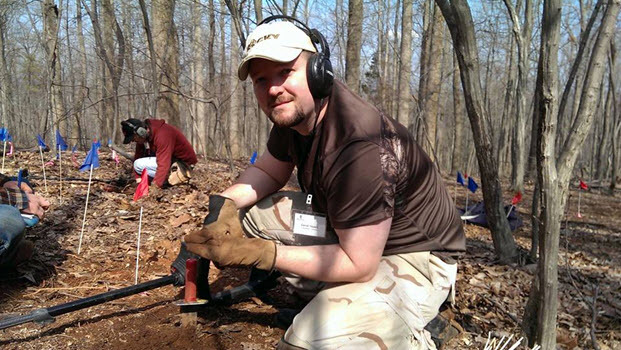 Use of a GSSI Profiler EMP-400 electromagnetic induction tool to test how buried metal objects affect data collection by creating anomalies. Picture shows Dayton Digger Jared Shank at Wright State University.